From the Doctors in a KFWH Sponsored Diagnostic Seminar in Lisbon. Most important of all, we need help!! Just think what a difference we all could make if every one of us out there connected to form a “life chain” for the people who need it! Can you imagine how many people could actually live a life or better life as a result? And wouldn’t it be important if we all made a difference as students reaching out to other families in the world who need our help? In early stages of Sleeping Sickness, it only takes $70! In the later stages, $400 can save a life! As our motto says, “Life is important for all people, rich or poor” and… everyone has a right to Life! 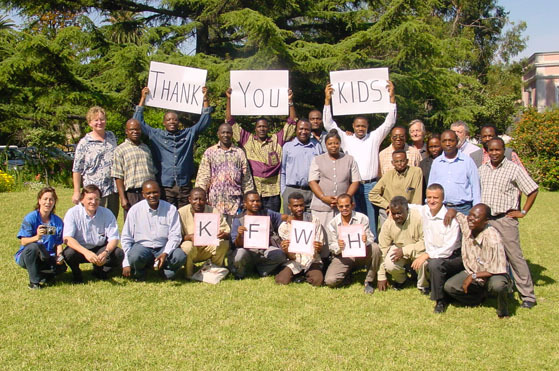 In joining Kids for World Health, there is much that you can do to help fight our target diseases. Here are some suggestions that have worked for us and that will add to the power of our voices as partners around our world! Educate yourself at our “Information Center”, “Links” and outside resources on KFWH targeted neglected diseases and global health issues. Your knowledge can teach others of all ages what is important to understand. Find a way to tell at least one other person what you have learned and ask them to spread the word! It’s amazing what we can do through simple communication. Find the simple truth of what is important. As Peter said, “Everyone, rich or poor, has the right to live.” Use your voice to pass your thoughts on to friends and family. The voice of kids can make a difference! Write your Congresspersons and the President about your concerns. Ask them to guarantee research for neglected diseases, and to support treatment programs for fighting major infectious diseases in our world. Ask them to help you save the lives of those who do not have access to medicines or treatment. Write to the pharmaceutical companies urging them to reduce the prices of life-saving medicines to the lowest possible cost for developing countries. Ask them to invest more money in finding new drugs for fighting infectious diseases that are affecting the poor. Start a Chapter of Kids for World Health in your school, place of worship, youth centers, or community or write us about a Global Health Week! Check out suggestions for “Forming a Chapter” and for planning a Global Health Week on our website at “Chapter Information”. But the most important thing you can do right now is to Become a Member and talk to your friends about doing the same. We CAN make a difference! Let’s do it together!